This post is sponsored by Better Homes & Gardens at Walmart. 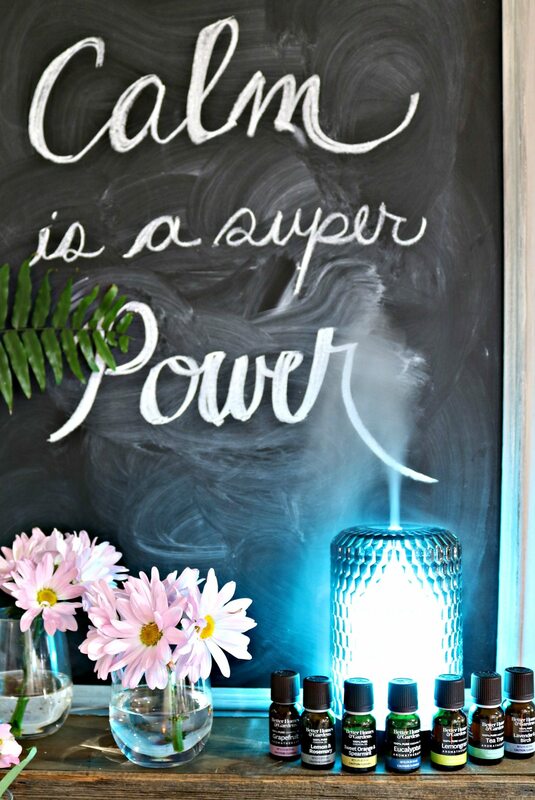 All opinions are mine, I love sharing affordable ideas and new products with you. 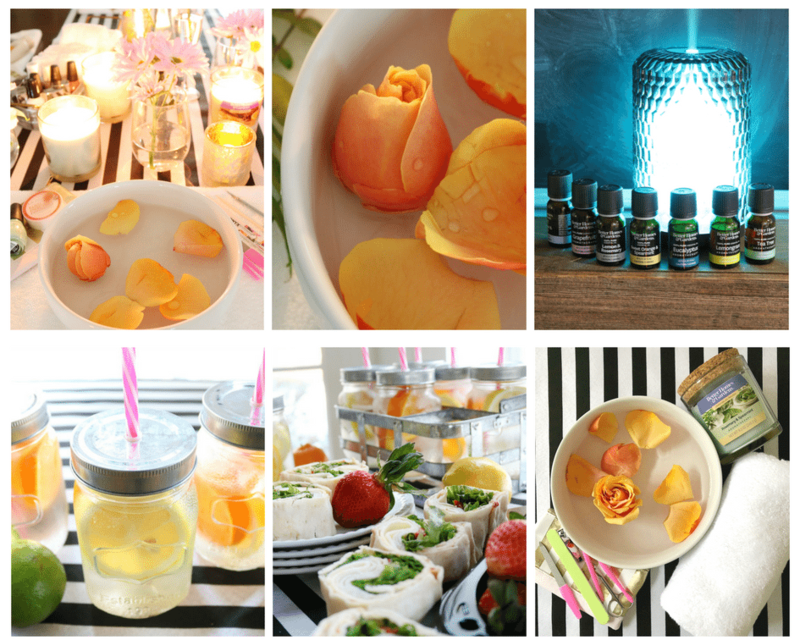 Hosting a spa party at home is so easy and perfect for a night in! 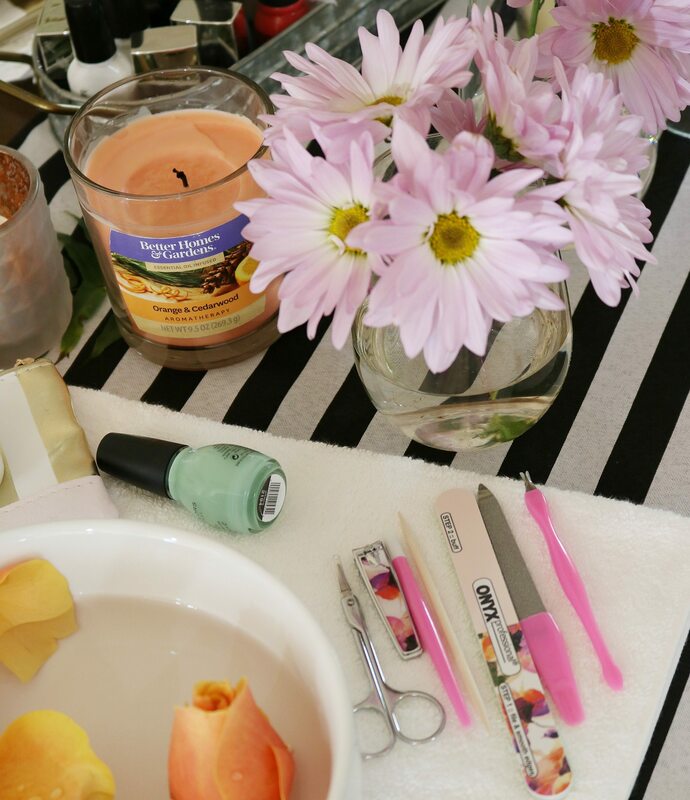 Create a relaxing atmosphere for pampering yourself and friends. It’s a great reason to get together for a night of fun. 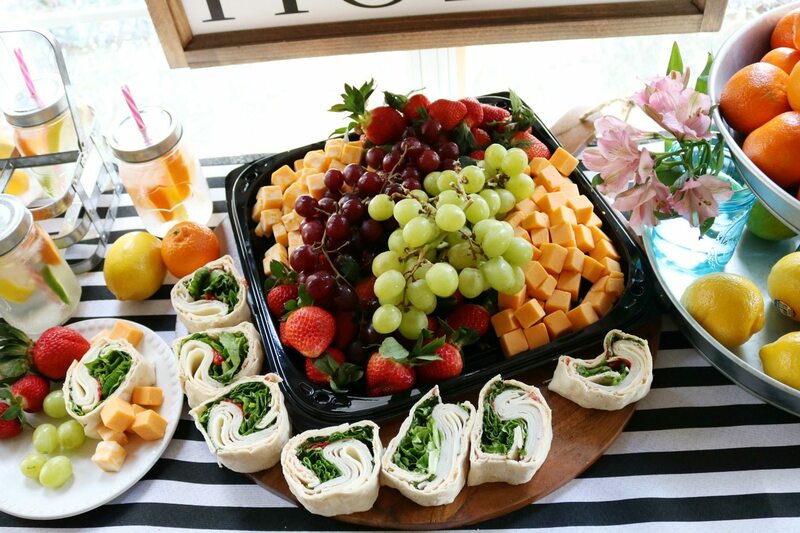 There’s something so refreshing about spending time with friends/family and there will be food. I grabbed these wire baskets, they came in a pack of two and were only a couple of dollars. 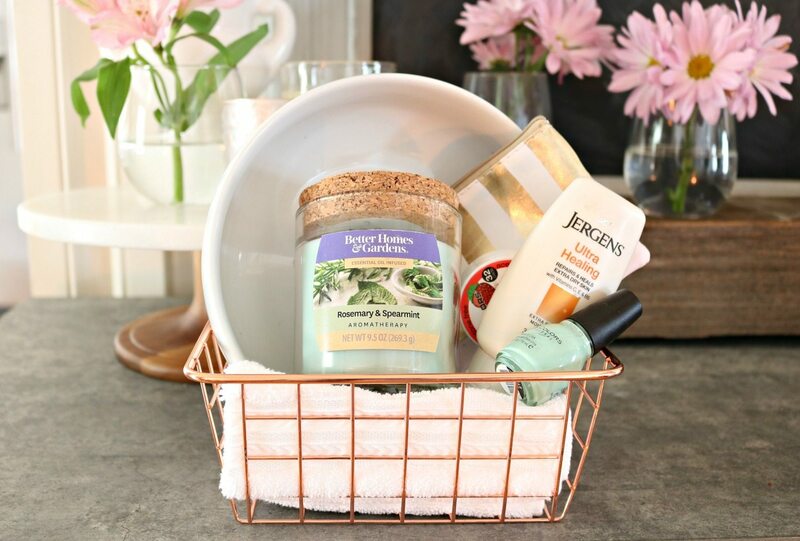 Perfect for putting together all the ingredients needed for a little pampering. 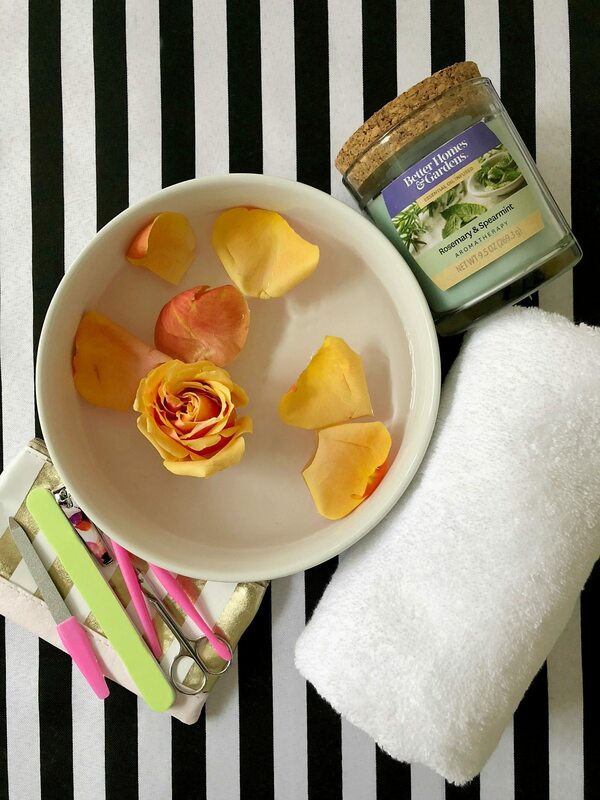 I included a Better Homes & Gardens Aromatherapy essential oil infused candle, a nail kit, lotion, nail polish, a hand towel and polish remover in each basket. When your guest go home it will be easy for them to recreate the night, there’s also a finger bowl included, aka Better Homes & Gardens salad bowl. 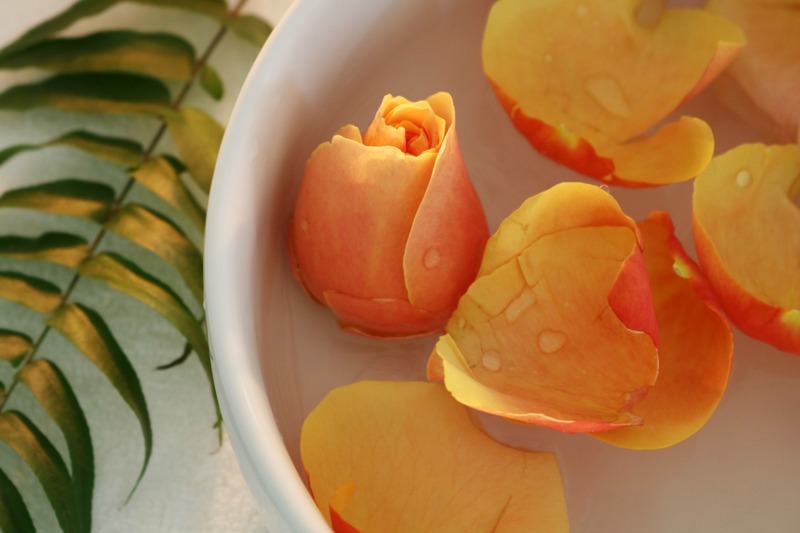 For our night in, I added warm water to the bowls and rose petals. 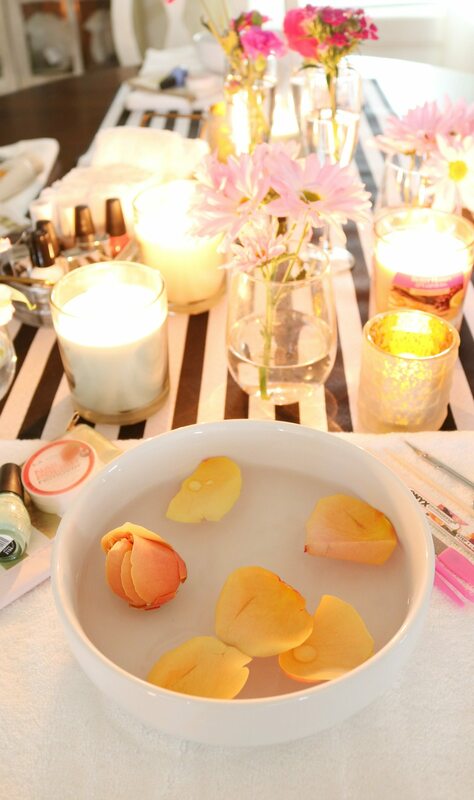 So pretty and appreciated by your friends, a simple idea to let them know that the night is all about pampering them. I filled my Better Homes & Gardens diffuser with water and added lavender & birch essential oil, it’s one my favorites. I’m excited about the variety of aromatherapy essential oils available from Better Homes & Gardens at Walmart. The diffuser light rotates through soothing colors or you can choose the steady option and stop at your favorite color. Another option is white or you can turn off the light and just diffuse the oil. 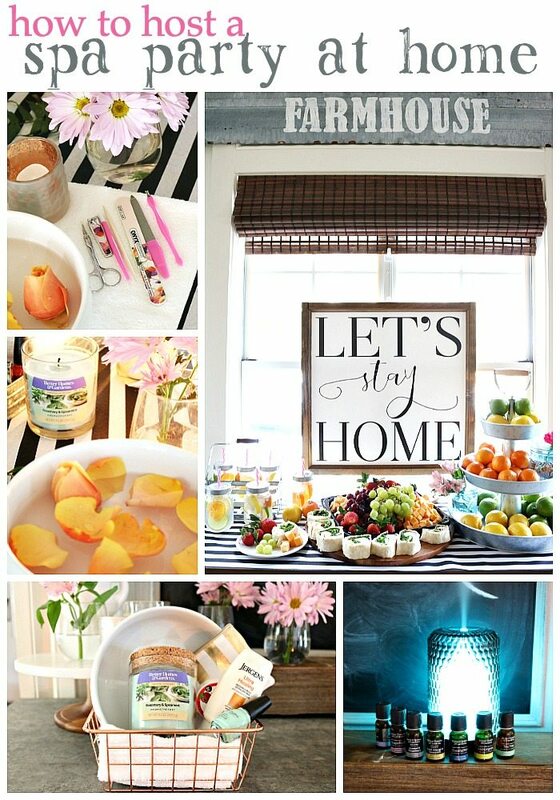 A few lamps and candle light are sure to keep the mood relaxed. 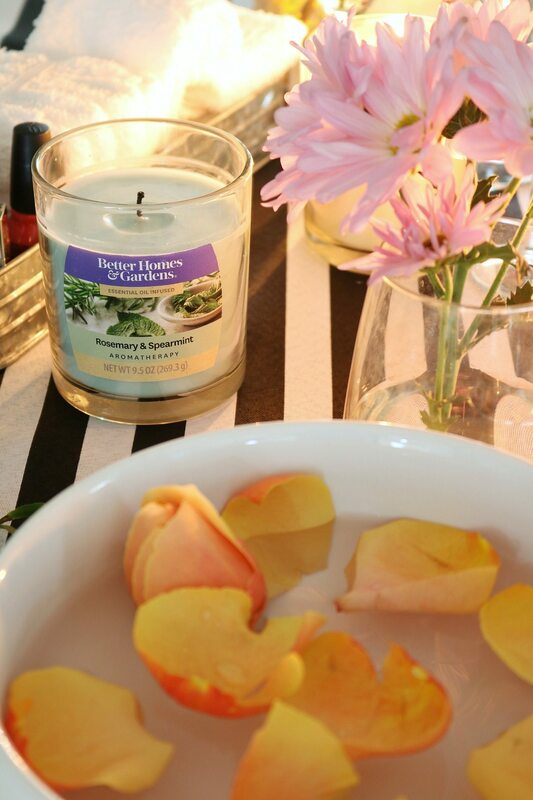 The Better Homes & Gardens essential oil infused aromatherapy candles come in yummy scents. Spread them around the house. All of these were purchased, I take the credit for styling. The night before, I sliced oranges, lemons and limes, placed them in a pitcher. Use a wooden spoon to muddle the flavors, add water and refrigerate overnight. Everything was delicious and looked so refreshing. As you can see it didn’t take much effort on my part to put it all together. All simple ideas, that are so worth it for your friends and you! 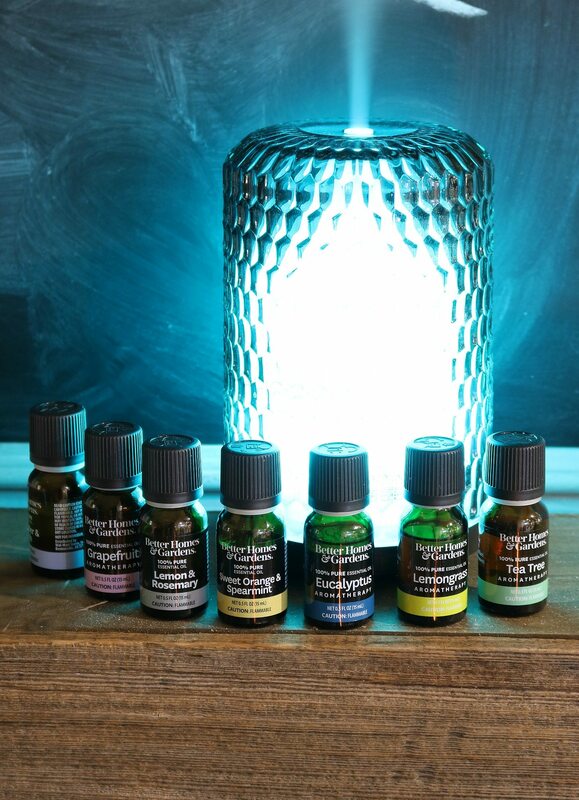 Better Homes & Garden Essential Oil Diffusers – check your local store for the aromatherapy jar candles. I found several cute oil diffusers there also. 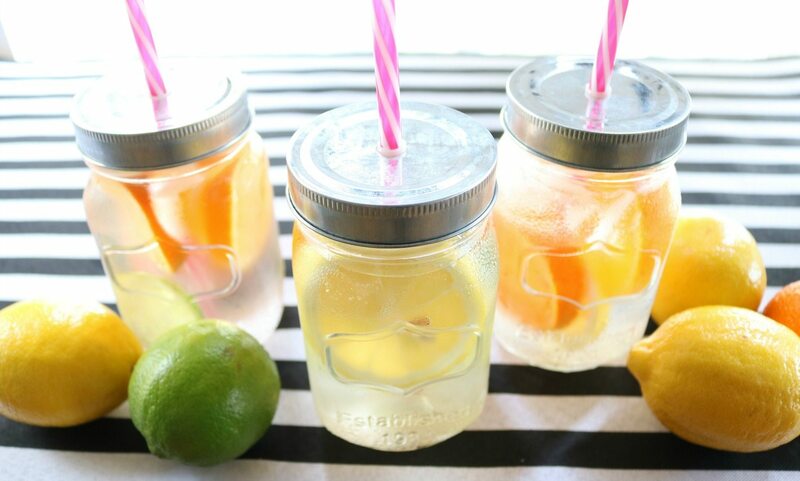 The Better Homes & Gardens mason jars in a cute galvanized metal tray. Nail kits with cute striped zipper bags. The food and flowers were from Sam’s Club. Be sure to Better Homes & Gardens at Walmart, check online, they have so many beautiful items! 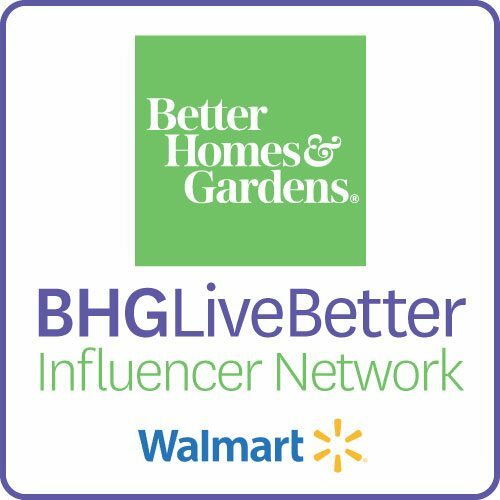 I love finding affordable decor and organization items at Walmart and sharing it with my readers, I am proud to be a part of the Better Homes & Gardens Live Better Blogger Network! Thanks Norma, I hope you can use some of the tips for yourself! I love the BH&G items at Walmart! My friends and I get together almost weekly for games and fun. I think we need to mix it up and have a spa party like this! 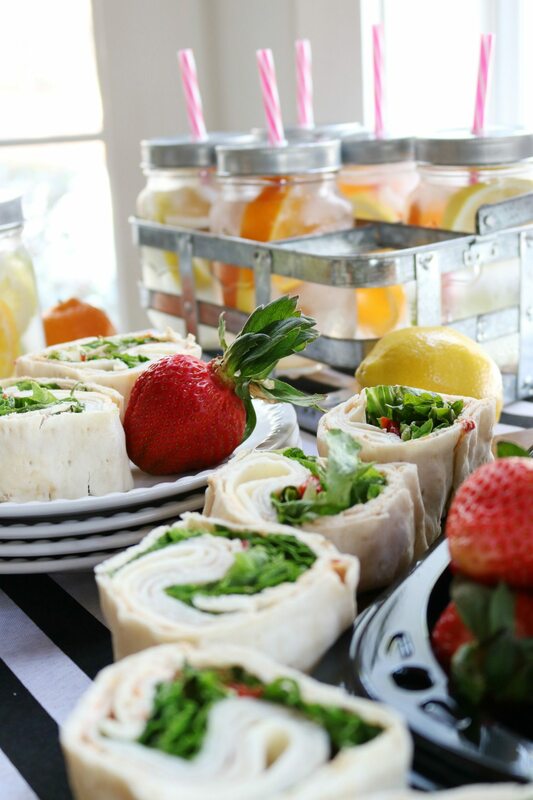 Everything looks perfectly enjoyable with the food and the fun! Debbie, I need a spa night. I bet some of my friends do too!! So many cute ideas, and yes, ya gotta have food 😉 Everything looked so pretty, I loved all your thoughtful touches. Thanks Shannon, you and your Mom could have a spa night! !